The simplest way to put it is that, you are eating foods as close to their natural state as possible, with little-to-no processing. Now, granted, when I was eating the raw plant-based ‘diet’, I DID make raw dishes/recipes that required blending ingredients together such as nuts, carrots, celery and seasonings to make nut pates or “burgers”; but there weren’t any weird ingredients and it was just processed in a food processor or blender. In other words, it didn’t undergo the extreme processing that most processed foods on grocery store shelves do. using taco seasoning mix from a packet vs. combining your own seasonings such as onion powder, garlic powder, salt, chili powder, etc. And depending on who you ask, some of even those ingredients wouldn’t be considered totally “clean” if say, the chili powder included anything other than dried, ground up chili peppers; such as anti-caking agents. But in all honesty, if someone really wants to get technical about the whole processing thing, COOKING alters the food by changing the chemical composition of it. The important thing to remember is that unless you are exclusively living off the land; eating only freshly grown fruit, veggies, and meat from animals that you raise and/or kill yourself – no one eats TOTALLY clean & pristine! 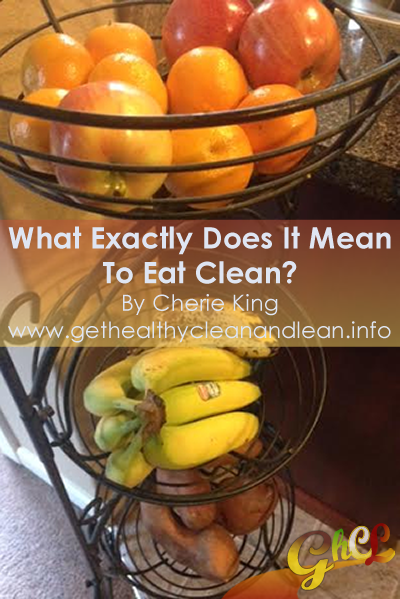 Again, the whole idea behind clean eating is to refrain from eating boxed, canned, pre-packaged foods as much as possible and to eat a diet consisting MAINLY of foods in their whole forms with minimal processing. Eat fewer foods that are marketed as being “quick” or “easy” to prepare because you’re microwaving or “just adding water” to it and go back to the way our grandmas did it… get the ingredients, get in that kitchen, and cook it yourself! Hopefully that makes sense and helps you to better understand what clean eating is – at least from my perspective!